Age Starts 1st 2nd 3rd Earnings Won the Bay Shore S. (Gr. 3), Miracle Wood S.
3 9 2(2) 4(4) 1(1) $330,114 Whirlaway S., Valley Forge S.
4 4 1 0 1(1) $37,100 3rd in the Derby Trial S. (Gr. 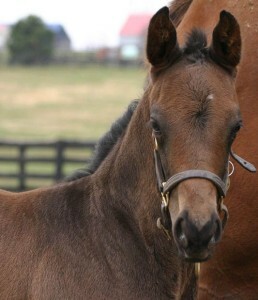 3), Rise Jim S.
J J’s Lucky Train was foaled on March 4, 2008, at Lantern Hill Farm in Midway, Kentucky. His dam, the stakes winning Thunder Gulch mare Delta Sensation, was boarded there by his breeder, EICO Stable. No doubt he had a great start in life. 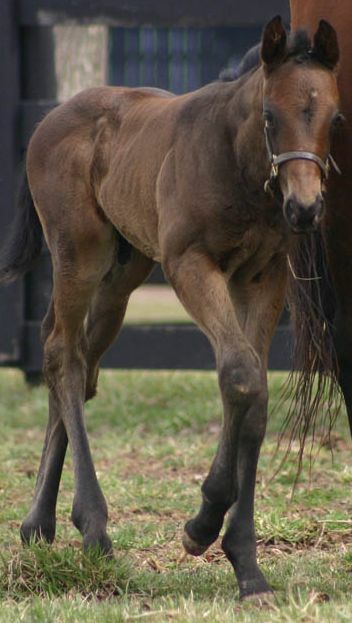 He is from the first crop of the millionaire sprinter Silver Train who stood in Kentucky at the time. J J was sold as a two-year-old in training at the May, 2010, Fasig-Tipton sale in Timonium, Maryland. Prior to the sale, he breezed an eighth of a mile in 10 4/5 seconds. His price of $35,000 would soon seem like a bargain. 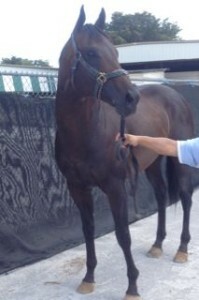 J J’s first start was on July 31, 2010, in a $40,000 maiden claiming race at Monmouth Park. He won by 2 ½ lengths and was claimed by a new owner. In his next start, the Grade 3 Sapling Stakes, he disappointed with a sixth place finish. J J closed out his two-year-old year in style, however, winning a pair of allowance races and earning a total of $74,000. J J’s three-year-old season was certainly his best. 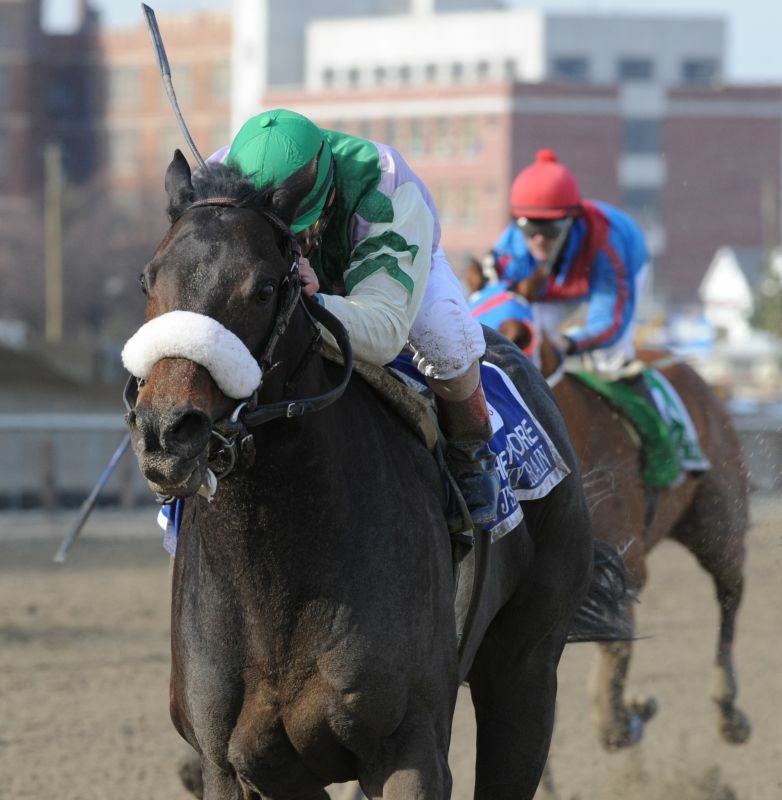 He kicked it off on New Year’s Day placing in the Count Fleet Stakes at Aqueduct. He followed that up with another runner-up effort in the Whirlaway Stakes. His first victory in 2011 came in the Miracle Wood Stakes at Laurel Park when he outran the favored Bandbox earning a Beyer speed figure of 97. In April, on the Wood Memorial undercard, J J was victorious in the Grade 3 Bay Shore Stakes, a seven-furlong test for three-year olds. Winning the Bay Shore put J J in very good company – past victors include Damascus, Hoist the Flag, Secretariat, Gulch, and recent champions Lost in the Fog and Trinniberg. J J continued to run at the top level and finished third in the Derby Trial (Gr. 3), second in the Woody Stephens (Gr. 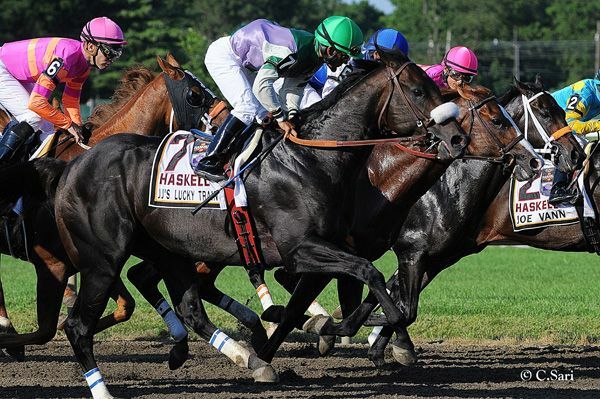 2), and fourth in the Haskell (Gr. 1). Overall, J J was on the board in seven out of nine starts as a three-year-old, earning $330,114. 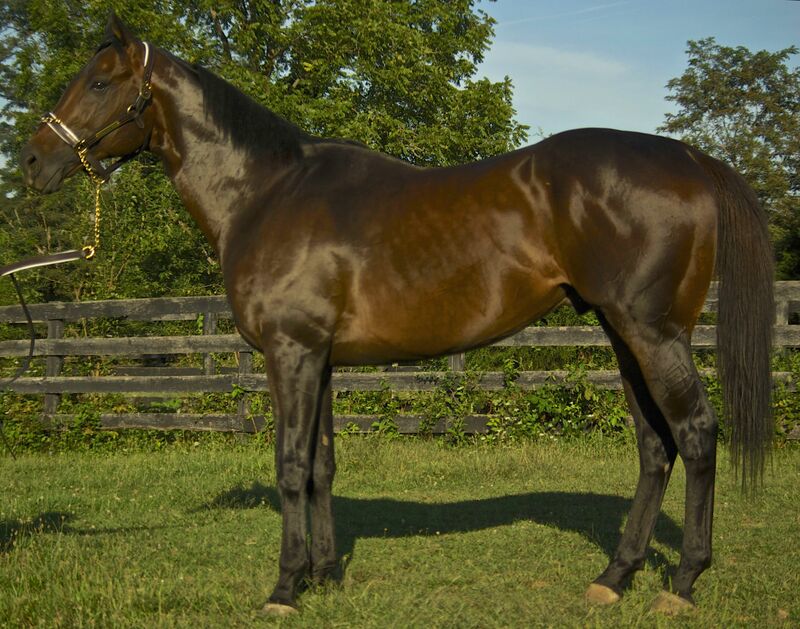 J J ran four times as a four-year-old, including a third place finish in the Rise Jim Stakes at Aqueduct and a win in an allowance optional claiming race at Monmouth. Dropped in for a $60,000 tag, he was claimed by a new owner. J J was given time off and came back as a five-year-old but could not compete at the same level. 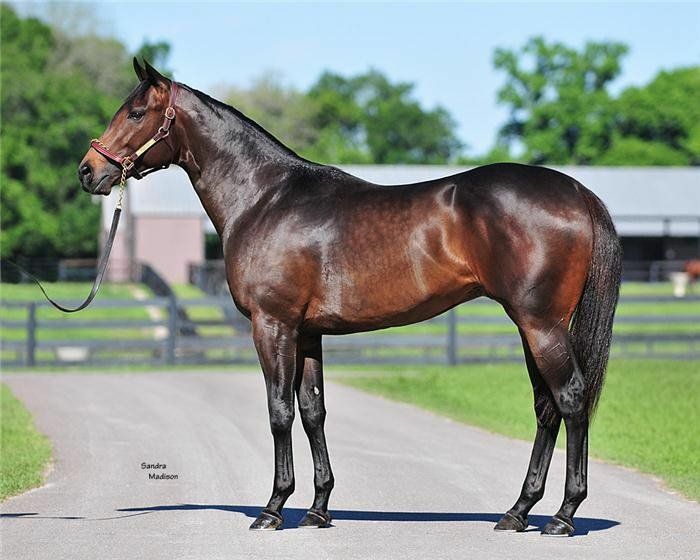 He dropped in class until he was claimed twice in December, 2013, at Gulfstream Park. Coming back as a six-year-old, and despite significant physical issues, J J managed to win a race in January, 2014, and finished a strong third in his last race. J J’s last race was on April 5, 2014 at Calder Race Course. Prior to the race, arrangements were made for J J to be claimed in order to retire him. He had surely earned his retirement after 25 starts in which he finished on the board 18 times and made $463,340. J J had a brief stay at Jacaranda Farm in Florida after leaving the racetrack. He then shipped to Virginia to Diana McClure and Michael Cooney’s Carousel Stable where he continued to unwind, be pampered, and enjoy what is a well-deserved retirement. It was clear to J J’s new caretakers that a horse with his class and heart, on top of a great performance record and pedigree, deserved a chance as a stallion. J J spent his first year at stud in 2015 at Blue Spruce Farm in Kearneysville, West Virginia. He spent the 2016 breeding season at Little Hawk Farm in Crozier, Virginia. He now lives full time at his owner’s farm in the Blue Ridge mountains of Virginia.